Back in 2013, I made my first Easter basket pattern which has been loved many times so far and it continues to rank well in my shop. The tradition of making egg cozies started then and there (and with a skip of a year or not )I am inclined to continue this tradition until I feel differently about it. What is different this time is that this pattern is completely free. I always try to make unusual cozies and while brainstorming ideas I thought of a poppy pod. And it all started from there. So, let's make it! For the cozies I used sport yarn and 1.9 mm steel hook. For the flowers I used embroidery floss and a 1.7mm steel hook. Also you need sewing thread and needle to sew the flowers on. The pattern below is for small eggs (53-63gr.). Used stitches: chain (ch), single crochet (sc), half double crochet (hdc), single crochet 2 together (sc2tog), slip stitch (sl st). Foundation: Ch 5 and join to make a ring. Rnd 1: sc 6 in ring. If making it with round 10 leaves you with a small opening, than repeat rnd 9 once more and end the pod there. Don't cut yarn. You'll be making the leaves. Before we start, please note that I made the leaves different and not two are the same in stitch count. For example, I made the first with 7 stitches, the next one 11, the third 9 and so one. The leaves shouldn't be very long because they will slop down. Also, while we are at them, when you are done, you can either wash them with a sprinkle of starch or spray them with fabric stiffener so that the leaves stay upright. Ch 7 and starting from the second st from hook, sl st in first 2 st, then hdc1 in remaining 4. Sl st it in the next st, sc in the next to it. Sl st in the next and chain 11. Repeat the leaf pattern (sl st in 1st two st, hdc1 in remaining). Repeat making different sized leaves until you finish the round. Using all the strands of the floss, ch 5 and sl st in the 1st st. Ch 5 and sl st in the 1st st of that chain. Repeat working this pattern until you have 5 such petals. Join the last one with the first one with a sl st. Tie both tails in a tight knot twice, thread the tails and weave them through. Work on the color arrangement. Thread a sewing thread and sew the flowers on. And you are done! So, how do you like them? I am going to gift these to my nieces and nephews this Easter. Maybe make some for my mom. She always makes an Easter village on her chest /stand in the living room so we'll see if these fit the scenery. Also I will be including this pattern as a gift with all my other paid patterns for Easter cozies if you are interested in having a printable copy, or as a free download on ravelry. Thank you Loni! I hope you enjoy the most of your Easter! Thank you Michele! A lady on ravelry already made some and put them in the garden. It was a sweet sight! 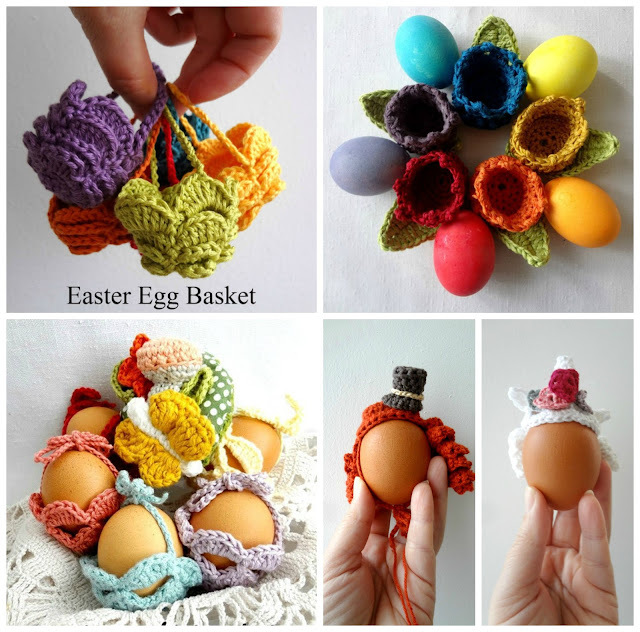 The Easter egg baskets you made are so adorable and cute and just perfect for decorating for Easter. Thank you for the tutorial on how to make them. I will have to give this a go sometime. Have a nice week and a Happy Easter Maya. Maya, these are adorable! Thank you for sharing another of your creative designs. Happy Easter.